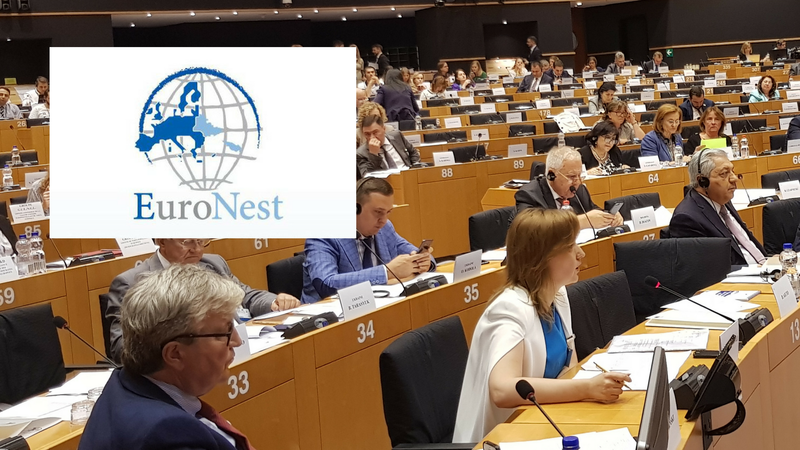 On 27 June, the Co-chairs of the Eastern Partnership Civil Society Forum (EaP CSF) Steering Committee, Krzysztof Bobinski and Aleksandra Kalatozishvili, addressed members of the European Parliament and Partner countries’s parliaments at the 7th Ordinary Session of the Euronest Parliamentary Assembly. In their speech, they welcomed the path for change opened in the EaP region after the success of the peaceful street protests in Armenia. They also raised concerns about the worrying tendencies in the Partner countries, especially regarding the recent developments in Georgia and Moldova and urged reforms to fight corruption and curb the power of oligarchs. Furthermore, they advocated for ensuring civil society funding at the next EU’s Multi-Annual Financial Framework (MFF). In relation to Armenia, Mr Bobinski stressed the fact that the demonstrations reached their goal without violence, which speaks volumes about the maturity of Armenian society including its former leaders who stepped aside in the face of the popular demands. Indeed, he welcomed and supported the dash for change in the EaP, as events in Armenia have already been followed by protests against perceived injustice elsewhere. Mr Bobinski underlined the upcoming and remaining challenges on rule of law and good governance in the EaP region. He commented on the recent developments in Georgia, where demonstrations over the investigation of two deaths in a brawl between schoolboys have led to the resignation of the Prime Minister and the Prosecutor General, and pointed to the urgent need for a deepening of reforms, including changes in the Prosecutors’ Office where proposals for change have been submitted to the Parliament by the Georgian National Platform of the Civil Society Forum. He also mentioned the worrying tendencies in Moldova, where Chisinau local elections were invalidated after a pro-European candidate won and it sparked demonstrations underlining the need for reforms in the country’s legal system. Mr Bobinski repeated the call of the EaP CSF Steering Committee on the EU to suspend all financial assistance to the government until the rule of law and democratic mechanisms are fully respected. Eventually, the Co-chair raised his voice to denounce the situation of the families of political prisoners in Azerbaijan that have taken to the streets to protest against the imprisonment of their loved ones challenging the authorities’ reliance on repression as a response to legitimate demands for change. On the other hand, Ms Kalatozishvili welcomed recent positions taken by the European Parliament, such as the warnings to the European Commission and the EEAS on the importance of not to sideline human rights in the talks for a EU-Azerbaijan Comprehensive Agreement, or the resolution adopted on Georgian occupied territories ten years after the Russian invasion. However, she also expressed civil society concerns on the current discussions on the structure of the 2021-2027 multi-annual budget. The proposals appear to envisage that most of the external funding instruments would be unified under one “Neighbourhood, Development and International Cooperation” instrument. This threatens a downgrading of the Eastern dimension in the EU external funding and within it the priority given to civil and human rights promotion and in that to civil society. Ms Kalatozishvili announced that civil society and the authorities in Georgia are united in their position that a new financing instrument for the associated countries is needed. She asked other EaP partner governments such as Moldova and Ukraine to follow suit.